Citizens´ Association "Landsberg in the 20th Century"
The entrance to the memorial can be understood as the “way of suffering and hope“. To the north, facing the street, there are six stones symbolizing the hope of Passover in 1945. That was the day when the survivors of this camp were sent on the death march. These six stones also stand for the six million killed Jews. 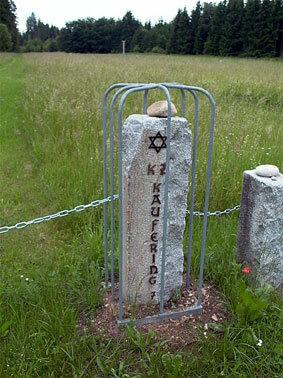 “Kaufering VII” is the inscription of another pillar placed next to the stones. This pillar is facing two other ones showing the Laws of Moses received at Mount Sinai . In the middle, on the ground, you can see a collapsed wall as a symbol of the liberation. 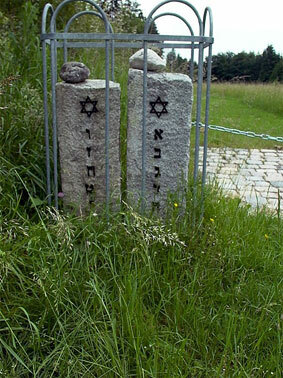 12 other stones line the way to the scene of the Holocaust. 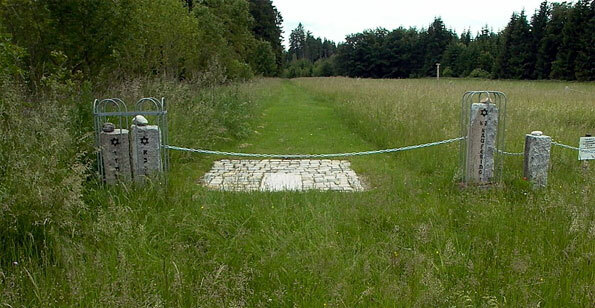 At the end of this way you can see the northern boundary of the former concentration camp. It consists of seven stones showing a Star of David, the symbol of the Jewish menorah. The entrance is framed by two pillars showing a Star of David.